When it comes to the restaurant business, Shareef Malnik could teach a Master class, after all, Malnik began working at his beloved Forge (now Forge | Wine Bar) at the tender age of thirteen. So when he decided to close down South Beach’s oldest restaurant and most storied landmark to give it a $10 million extreme makeover, transforming the look, feel, philosophy, and menu, there was no doubt that the result would be “a good thing,” to quote Martha Stewart. And, in fact, it is a very good thing. Upon entering the Forge | Wine Bar, the most striking difference is the radical change in décor, from dark Gothic to light, airy, ethereal and almost whimsical. Eclectic furnishings, a glass enclosed VIP dining room with an enormous Balinese table flanked by throne-like chairs, surrounded by floating glass bubbles and a state-of-the art Enomatic wine machine are just a few of the factors that have transformed the Forge into a great space, vs. merely a restaurant. Inspired by hotel lobbies all over the world, Malnik envisions the Forge | Wine Bar to be the place where guests can go for a variety of reasons: from enjoying an elaborate, decadent meal- for which this institution is well-known, to a light bite, wine and cocktails at the bar or a book at the cherished library, complete with working fireplace, stocked with a wide assortment of books curated by Mitchell Kaplan. Another modern touch is the addition of WiFi and Apple-technologies, which redefine the Forge into “Power Lunch” central (don’t pack that briefcase yet, the lunch menu is still in its final stages). The center bar, which used to command the restaurant, has been moved over to one side and Glass the nightclub, is long gone, in keeping with Malnik’s vision for the restaurant’s new direction. Sidebar: despite’s Malnik’s efforts at de-emphasizing the Forge’s notorious party reputation, the place continues to get packed to the rafters on Wednesday nights, even though there is no longer the “official Wednesday night dinner party.” Think of this as the Party Effect. The most unique addition to the Forge | Wine Bar is the high-tech Enomatic wine system featuring 80 bottles available in self-service pours of 1.5, 3 and 5 ounces (starting price: $6). Buy a wine card ($15 minimum) and roam around the bar and dining room, as if you are Trick or Treating for wine! Beyond the physical changes, the transformation includes a menu overhaul that now includes 65 items, in which Chef Dewey LoSasso (who Malnik selected from 172 candidates) incorporates local and seasonal produce and artisanal purveyors such as Niman Ranch and Paradise Farms. Forge classics like the chopped salad and 16-ounce “Super Steak” remain intact. Why mess with perfection? Despite the many creative “Savory Snacks,” which include a bizarre-sounding-yet-tasty, lobster “peanut butter and jelly” sandwich, it’s the caramelized onion Focaccia, a Forge staple, that’s worth the price of admission and is so worth blowing off your personal trainer for a day or two. Also remaining intact, is the wood-paneled wine cellar, boasting the owner’s private collection and large communal table for private dining. For the most part, menu items are reasonably priced, ranging from $8-$15 for starters and $19-$52 for main courses. The best value is the “Burger and Bordeaux,” think of it as a foodie’s “Happy Meal:” a hefty grilled sirloin patty topped with braised short ribs and lobster marmalade and served with addictive truffle fries, pomegranate ketchup and a small chalice of red wine for only 20 bucks! Johnny V’s dessert maven, Malka Espinel, prepares an array of sinful treats. If the walls (now blonde) could talk they may tell stories about the many colorful Forge patrons throughout the years, including: Frank Sinatra, Sammy Davis Jr., Sir Paul McCartney, Lauren Bacall, Andy Warhol, Michael Jackson, Mickey Rourke, Matt Damon, Tom Cruise, Katie Holmes, John Travolta, Kelly Preston, Marc Anthony, Jennifer Lopez, Lance Armstrong and Adrian Grenier to name a few. The Forge Restaurant | Wine Bar is located at 432 41st St., Miami Beach. Hours of operation are Sunday-Thursday, 6 p.m.-midnight; Friday-Saturday, 6 p.m.-1 a.m. Valet parking is still $5. 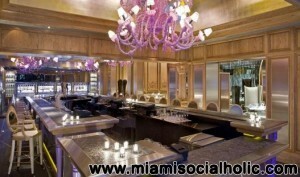 For reservations, call 305-538-8533 or visit www.theforge.com for more information.